PESHAWAR, Jan 30 2017 (IPS) - The Federally Administered Tribal Areas located on the Pakistan-Afghanistan border remain one of the most perilous places in the world to be a reporter, with journalists walking a razor’s edge of violence and censorship. FATA has been a bastion of Taliban militants since they crossed over to Pakistan and took refuge when their government was toppled in neighbouring Afghanistan by the U.S.-led Coalition forces towards the end of 2001. Militants have used the area as a base to target security forces as well as journalists whom they perceive as pro-government. 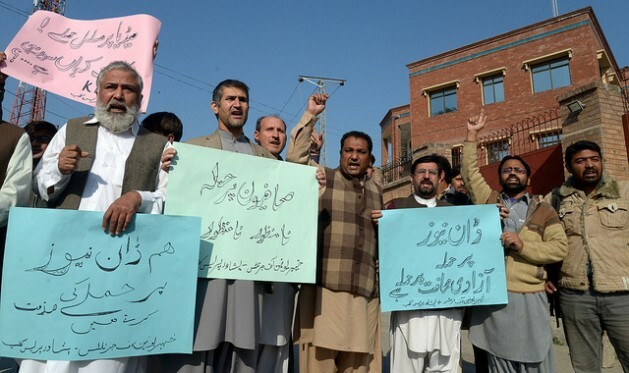 Muhammad Anwar, who represents FATA-based Tribal Union of Journalists (TUJ), said that excessive violence, threats and intimidation remain a fact of life. “There are two options with FATA’s journalists: either to face death or stay silent over what is going on there,” he said. Hayatullah Khan was the first journalist killed, in June 2006 after being kidnapped in December 2005 in Waziristan. Since then more than 20 journalists have been killed in the seven agencies of FATA, allegedly by Taliban militants who were unhappy over their reporting. “Taliban militants set on fire a newspaper stall when they saw news highlighting their activities. They also warned the reporters to stay away from coverage of the Taliban’s punishments of local people,” Muhammad Shakoor, a journalist from North Waziristan, told IPS. Shakoor, who now lives in Peshawar, the capital of Khyber Pakhtunkhwa (KP), one of Pakistan’s four provinces, recalls how militants’ threats have prompted many journalists to flee to other parts of the country. The situation in Swat district in KP also turned sour for journalists during the unlawful rule of the Taliban from 2007 to 2009. “Taliban militants intimidated local journalists. At least three of them were killed because they were disliked by the Taliban militants or the Pakistan Army,” Muhammad Rafiq, a local journalist, told IPS. Reporters fear for their lives and take extreme caution while filing their stories. “We are stuck between militants and the army. We don’t know about the killers of our colleagues who have fallen in the line of their duties,” Rafiq said. The Taliban may have disappeared as a result of military operations, but they still have the capability to target journalists, he said. “Most of the 200 reporters from FATA have migrated outside their districts and do their work from safer places. We are unsafe. There’s no protection at all,” Muhammad Ghaffar said. Ghaffar, who works with an Urdu newspaper in Mohmand Agency, said that it’s not only insurgents. They also face threats from the local political administration who wants them to toe the line. “It is almost impossible to do independent reporting due to lack of protection. Journalists are surrounded by a host of problems, due to which they have to remain careful,” he said. Journalists in Pakistan are targeted from “all sides” even as the conditions for media in the country improved slightly. “Journalists are targeted by extremist groups, militant organisations and state organisations,” says a new report on press freedom by Reporters Without Borders (RSF). The report, released early in January, showed that Pakistan had jumped 12 spots to 147 in RSF’s in 2016 World Press Freedom Index, up from 159 in 2015 and 158 in 2014. Pakistan stands at number two in the international index of the most dangerous places for journalists, who face harassment, kidnappings and assassinations, RSF said. During the last 10 years, more than 100 journalists have been killed in Pakistan, with almost 98 per cent belonging to FATA, Khyber Pakhtunkhwa and Baluchistan province. The Pakistan Federal Union of Journalists has demanded that the government file cases or reopen old investigations into dozens of murdered journalists but there has so far been no action. Last year, the International Federation of Journalists reported that Pakistan was amongst the most dangerous countries in the world for journalists, with 102 journalists and media workers having lost their lives since 2005. The IFJ’s report said that since 2010 alone, 73 journalists and media workers have been killed — almost one journalist every month. It termed Balochistan province a ‘Cemetery for Journalists’, where 31 journalists were killed since 2007. “The armed insurgency and sectarian violence account for a number of these killings but many of them raise suspicions of the involvement of the state’s institutions,” it said. The killers of journalists mostly walk free, as Pakistan has so far recorded only three convictions. Mar. 16, 2016 marked a rare occasion for journalists in Pakistan to celebrate the third verdict convicting a murderer of journalist when a district court in KP sentenced a man named Aminullah to life imprisonment for the killing of journalist Ayub Khattak on Oct. 11, 2013 for his reporting on the drug trade, in which Aminullah was involved. In March 2016, senior journalist Hamid Mir was targeted by unknown assailants who inflicted grievous injuries. The attackers were never found. Mir, who later received the “Most Resilient Journalist” award by International Free Press in Holland in November, said he escaped the assassination attempt but wouldn’t leave Pakistan because people stood behind him. He dedicated his award to the people of Pakistan for showing bravery against militancy and terrorism. “The award is recognition of my sacrifices for advancement of journalism, which encourages me,” he said.